The work of photographer Tony Leonard, described at the Ansel Adams of the thoroughbred industry, is currently on show at Kentucky’s Headley-Whitney Museum in Lexington. His photos, including fine art photography, portraits, celebrity candids and more, were never viewed by anyone other than his wife, Adelle, and a few close friends. Tony Leonard captured this shot of 1987 Kentucky Derby winner Alysheba with his trainer, Jack Van Berg. Leonard served in World War 2 and on his return became a Broadway performer and singer. But when Adelle gave him a camera, a new passion was kindled. The couple came through the Bluegrass region of Lexington, Kentucky not long after that for an engagement at the La Flame nightclub, and they liked the town and decided to stay. Enjoying a drink one evening at the club with a local horseman, Tony started talking about his new hobby, and the horseman asked him to come out and shoot pictures of some yearlings for his clients. The next day, Tony found his true calling in life in a field full of horses, and soon the hobby became the driving force in his life, and singing became the hobby. 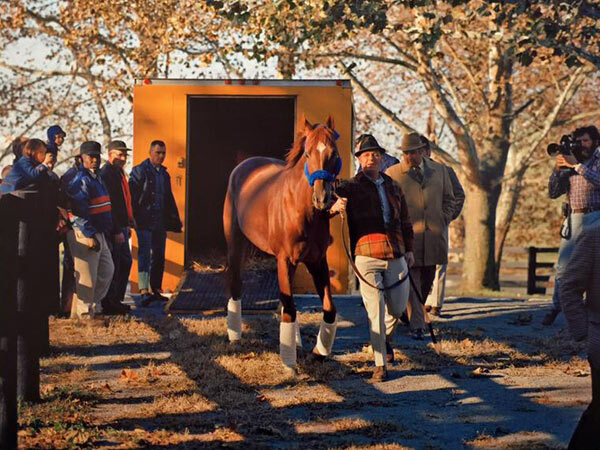 It was fortuitous for all racing fans that he was there, camera in hand, to chronicle the life of Secretariat, one of the greatest of all American Thoroughbreds. Tony loved that horse, and never missed a chance to drop in to Claiborne and catch the champion out in his paddock. After Leonard’s death just short of his 90th birthday in 2012, a trio of friends and Leonard aficionados bought the rights to his collection, and were astounded at the undiscovered bounty. Leonard’s cameras captured the iconic images of the horse champions, as well as the owners, trainers, jockeys and celebrities of the golden age of Thoroughbred racing. “Tony produced an astonishing body of work over more than 50 years, and his talent for capturing the magical moments in Thoroughbred history remains unmatched. We felt personally compelled not only to preserve his collection, but also to share it,” said Bobby Shiflet, one of the collection partners who knew Tony for more than 20 years. A selection of rarely seen photos and personal artifacts will be available for the public to experience firsthand at the “Tony Leonard Collection” exhibition, presented by Kentucky Bank, to be held at Lexington’s Headley-Whitney Museum of Art from March 11 through June 19. Leonard is best known for his stunning photos of America’s legendary racehorses, including Secretariat, Seattle Slew, Affirmed, and Cigar. The entire collection spans Leonard’s 50-year career and includes about half a million photo negatives, plus prints, posters, commercial photography and more. The upcoming exhibition showcases about 200 photos that develop a comprehensive view of Leonard’s artistry. Kentucky Bank, which currently houses and protects the sprawling collection in one of its branch vaults, is presenting sponsor of the exhibit. While the collection will include some of Leonard’s familiar themes – powerful Thoroughbreds and America’s historic racetracks – art fans will be surprised and thrilled by his images of the world’s cities, celebrities and landmarks. A catalog of some of Leonard’s work, with opportunities to purchase some rare examples of his photos, is expected in the coming months. “We are thrilled to be the first museum to showcase this amazing collection of work by such a great photographer,” said Amy Gundrum Greene, director and curator of the Headley-Whitney Museum of Art. “There are so many horse racing fans and industry insiders who have framed Tony Leonard photos in their homes, and it’s easy to keep him in that box, as the ‘horse photographer’,” said Shiflet. The exhibition runs until June 19.